For many years, the Bureau of Agricultural Economics (BAE, now ABARE) mapped Australia as three national agricultural zones on the basis of the use primary producers made of the land. The most prosperous was always the ‘wheat/sheep zone’, or wheat belt: the others were the inner, largely semi-arid, ‘pastoral zone’, and the ‘high rainfall zone’ that lies between the wheat belt and the coast. The last two were used almost solely for grazing and were identified by the absence of crops. In the mid 1970s, Dr Jim Davidson was a CSIRO research agronomist in a team aiming to improve grazing management in the NSW tablelands, the coldest part of the high rainfall zone, when a crash in meat and wool prices threatened the livelihood of its producers. Many were reduced to poverty which was graphically described in sociological reports that convinced Davidson that no improvement in grazing management could lift them from financial misery. He was determined that they should have the same opportunities to grow wheat that the wheat/sheep zone offered. That they have those today is a consequence not only of his work but also of the efforts of good people who helped him. 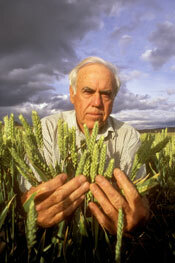 Almost universally, Australians have considered Australia to be a dominant wheat-producing nation. In his first step, which was to examine production from different countries, Jim Davidson found that England, which is smaller than Victoria, was producing as much wheat as Australia. It did so through its average yields being five times ours (7.5 versus 1.5 t/ha) which he attributed to two climatic advantages in addition to any advantage of water availability. First, the UK has a cooler climate after wheat flowers, which lengthens the period of grain filling; second, its higher latitudes provide about five hours longer daily for photosynthesis during grain filling (summer in England, spring in our wheat belt). Such advantageous conditions are only approached in the cool parts of our high rainfall zone, i.e. in the tablelands of NSW, eastern and southern Victoria, the south-east of South Australia, the south-west corner of West Australia and Tasmania. Davidson reasoned that crop yields should be highest there and the case for cropping there seemed indisputable. I like to think that from the moment I found that UK yields were five times ours, I knew that with sound research planning and a breeding program based on the highest yielding varieties that we couldn’t fail. That kept me going whatever the difficulties were. The main determinant of the ability of any variety of wheat to yield well in a particular environment is its flowering time. If it flowers too late it will experience heat and temperature stress, and in cool parts, if it flowers too early its yield will be savaged by frost. From Mr K Symes, Director of the Australian Wheat Collection at Tamworth, Davidson obtained small samples of 68 Australian and 49 overseas notable wheats. After he had multiplied them, he and three close colleagues examined their responses in flowering time to the two environmental conditions known to accelerate it: a 6-week period of low temperatures on germinated seeds (known as vernalisation), and long days (light period extended to 16 hours by incandescent light). Across the range of varieties both cold treatment and long days accelerated flowering by 0 to 100 days. The results allowed the selection of a sub-sample of 24 varieties that covered the entire range of responses. These were used later in further studies of flowering control and in field experiments aimed at defining principles of management. Additionally, the results clearly divided varieties into the two great groups of wheat, namely spring wheats which have little need for cold treatment, and winter wheats which must experience low temperatures if they are to flower satisfactorily. Significantly, a Tasmanian variety, Isis, was the only winter wheat in the Australian sample. With few exceptions, only spring wheats had been produced in Australia, and these had apparently been of little use in the high rainfall zone. In the cold parts of the high rainfall zone, winter is always a period of acute feed shortages resulting from pasture growth rates falling towards zero. Davidson realised that producers would not replace pasture with wheat unless it could provide as much winter feed. Its advantage would then depend on its ability to recover from grazing to later produce a profitable grain crop. While wheat’s ability to yield well depends on its flowering time, its ability to recover from grazing depends upon its growing points remaining below ground, and so safe from damage, until grazing is over. Both circumstances depend upon the rate of development of the growing point, or shoot apex, which initially is a tiny gelatinous dome at the base of every shoot. Around its surface, while it is vegetative, are raised ridges which expand into leaves. At floral initiation or double ridge stage, (which depicts transition to reproductive development), the regions between the ridges expand and grow into floral parts, and end the formation of leaves. The growing point is then a tiny ear and the stem below it expands to raise the ear above ground; so the date of ear initiation is the last day of safe grazing. Of the 24 varieties selected to reflect the range of variation available in wheat, 12 were spring types and 12 were winter types. These were sown in field plots in cold environments (Canberra and Bombala) at 4-week intervals from early March until early May. As each variety reached floral initiation its dry matter production was measured and again at ear emergence. The wide variation that had been noted in flowering responses was reflected in the field by wide variation in the time to ear initiation. Following the early March sowing, ear initiation varied among varieties from three weeks to five months after sowing. All spring wheats reached ear initiation before any winter wheat and all varieties grew at a constant rate until ear initiation. That rate reduced with delayed sowing, from 30 kg/ha/day from the early-March sowing to just 1 kg/ha/day from the early-May sowing which was useless for winter feed supplies. The basic principles of management are therefore to sow early, in late summer or by early March if possible, and to graze late, not until winter, to ensure substantial feed supplies from a long period at the constant growth rate. By then only winter wheats can be safely grazed because the ears of spring wheats will be above ground and will be destroyed by grazing or frosts. Only long-season winter wheats can be safely grazed and must be chosen for grazing plus grain. After ear initiation, herbage production was much faster than before it. Thus the earliest initiating variety, William Farrer’s Sunset, had produced 10 t/ha of dry matter when its ears emerged in winter, while the still-vegetative winter wheats had produced less than 4 t/ha. Subsequent field trials confirmed that a refinement of management principles is to mix the long-season winter wheat with Sunset or similar modern variety. This mixture provides more winter feed than a permanent pasture can and grain yield remains high because the winter wheat becomes the entire crop. By the time of those studies, Ron Martin in NSW Agriculture at Temora had bred outstanding winter wheats, including Rosella, that allowed a wide range of successful sowing times in the wheat/sheep zone. In tablelands trials these were too early in initiating ears to survive winter grazing and too early in flowering to survive frosts if not grazed. Subsequent studies in controlled environments by a PhD student, Teerasak Manupeerapan, jointly supervised by Davidson and Professor Craig Pearson of Sydney University, showed that the difference between short-season and long-season winter varieties is due to differences in the growth rate of the tiny vegetative growing point. In all varieties studied under a range of conditions, initiation always occurred when the growing point had grown to one eighth of a cubic millimeter in volume. Rosella had the same responses to day-length and vernalisation treatments as the very long-season winter wheat, Maris Huntsman (UK), but initiated ears much earlier because of an inherently faster-growing growing point. Together with effects of vernalisation and day-length, the growth rate of the vegetative growing point is a major factor determining flowering time in wheat, although at initiation it is less than one ten thousandth of the size of the eventual ear and is many weeks from flowering. With the accent on varieties to withstand grazing in winter, Davidson began a crossing program based on high-yielding UK winter varieties and one adaptable Mexican dwarf spring variety, selecting for winter types, disease resistance and yield in subsequent segregating populations. With seven subsequent generations required to produce pure lines, progress was necessarily slow. When his first lines were crossed again to UK wheats, several resulting lines doubled the yield of Isis, the only commercially available alternative, and one was registered and released as ‘Lawson’, a red-grained feed wheat. Its release was controversial because until then, all wheats released in Australia had been white-grained and of milling qualities able to improve British bread, even though Britain had not needed Australian wheat for many years because of its own improvement of quality and improved bread-making procedures. Grain colour applies to the seed coat, not the flour, and red grains can greatly improve resistance to sprouting should it rain near harvest. Because there was a huge demand for feed wheat in our neighbouring Asian countries, ‘Lawson’ opened up new markets for premium feed wheats. With varieties such as Paterson, Gordon, Tennant, Brennan and Dennis following, the breeding program catered for different parts of the high rainfall zone with varieties with increasing resistance to disease. The program produced the first variety resistant to the major stunting disease, Barley Yellow Dwarf Virus (BYDV), the long-season winter wheat Mackellar which was registered by Susan Kleven who first worked with Davidson and later succeeded him. Cropping is now a major industry in the high rainfall zone in Victoria and neighbouring regions and is the legacy of the work of Jim Davidson and a group of praiseworthy people who either supported or took it much further through overcoming daunting environmental barriers and incorporating rotational crops. They have helped to transform agriculture and the lives of many producers in the zone, and their invaluable contributions should be acknowledged. Richie Southwell, farmer and seed merchant of ‘Bundarra’, Bredbo, NSW, was the first person to support Davidson’s work through providing and preparing trial sites, providing equipment and maintaining plots. After almost 30 years he is still doing the same for Davidson’s successor. He persuaded another seed producer, Andrew Roberts of ‘Hillside’, Cootamundra, NSW, to collaborate in a more fertile region through a succession of trial sites and to grow the first commercial crop of CSIRO’s first winter wheat, ‘Lawson’. Bob Freebairn, district agronomist at Coonabarabran, NSW, was the one agronomist clamouring for wheats that could withstand grazing in winter. He included Davidson’s lines in his trials and influenced the breeding program to cater for the slopes adjacent to the high rainfall zone. Dr Don Marshall, Professor of Plant Breeding at Sydney University, on realising that funding bodies were not funding Davidson’s work, transferred his own research grant to him to provide a second assistant, Susan Kleven, a science graduate who went on to a Masters degree in plant breeding. She so excelled in the work that she took over Davidson’s role when he retired from CSIRO. Dr Bob McIntosh, Sydney University’s world authority on the genetics of rust resistance in cereals, screened all of the CSIRO breeding material for disease resistance and repeatedly monitored high rainfall zone crops for disease incidence. Dr Phil Larkin and Dr Phil Banks of CSIRO Division of Plant Industry were responsible for making BYDV resistance available to wheat breeders in a major contribution to the wheat industry and especially to the long-season winter wheats. It brought pleasure to watch, on ABC TV, this crop being stripped and weighed in as a clear record. It was then that I knew that we would at last succeed with wheat cropping in the high rainfall zone. The AWB selection of sites proved to be even more influential at a farm near Hamilton. A very progressive producer, Neville Huf, was so impressed by a 7 t/ha crop of ‘Lawson’ grown in waterlogged soil that he asked a visiting committee of the grains research funding body (GRDC) to support work on winter wheats. The Chairman told him to go home and grow oats. Instead, he drove to Ballarat to persuade Chris Bluett, research agronomist with Agriculture Victoria, that farmers would have to fund and do their own research. Southern Farming Systems was formed, with an outstanding farmer, Bruce Wilson, of ‘Murdeduke’, Winchelsea, as Chairman and its initial driving force. With the closest collaboration and support from the start from Agriculture Victoria agronomists, Chris Bluett and Bruce Wightman, Southern Farming Systems has been doing its own research into the most urgent problems facing crop production. Its success in dealing effectively and simply with waterlogging, fertiliser requirements and cropping alternatives has led to a rapid expansion of cropping in the Victorian high rainfall zone and in Tasmania. It is now an organisation of 800 farmers who translate successful trials into immediate farm practice, offering a model that can be followed wherever research is needed to transform agriculture. If Southern Farming Systems had not been formed, the development of the high rainfall zone would have stagnated; as every other breeder and agronomist in the Division of Plant Industry ignored the high rainfall zone and continued to work in the wheat belt (where those from State departments and universities were working). Southern Farming Systems developed the most sophisticated cropping procedures in the world, based on rapid formation of raised beds to counter waterlogging. In the Western Districts these went exponentially from 3 ha to 30 000 ha within five years. Although lower rainfall has since reduced the need for raised beds, now more than 500 000 ha are being cropped ‘ a remarkable achievement. Davidson JL, 2009, Personal communication.